If you're looking for professional Clinton Township carpet installation, you've come to the right place. With all of the benefits you can get from the services we provide, do not look anywhere else. We are here to handle all of your carpet installation needs. Clinton Township carpet installation has never been easier. 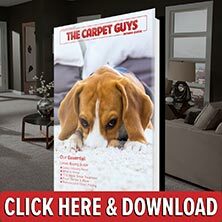 The Carpet Guys is a family-owned business based in Michigan. Local family-owned flooring businesses are known to be the best places to buy carpet, and we live up to that title. In 2010, we were voted the number one company in Metro Detroit to buy carpet, and The Macomb Daily Newspaper raved about us shortly after. We have maintained an A rating with the Better Business Bureau for quite some time. For the past three years, we have won the Angie's List Super Service Award. We are one of eight of companies in the Metro Detroit area to hold a place on the Angie's List Honor Roll. Whatever your Clinton Township carpet needs may be, The Carpet Guys are prepared to handle them. To get started on renovating your home, schedule a free in-home estimate via our website or by phone. Fresh and beautiful Clinton Township carpet is only a click away.